After working on some fiberglass projects this spring, and accidentally spilling acetone onto the deck, a little bit of the acetone had seeped into the deck fill and melted the plastic waste deck fill cap firmly in place. 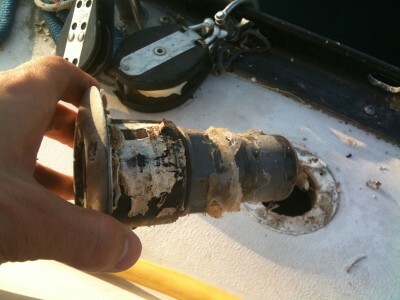 When the summer boating season came around and I arrived at the pump out, I had put so much force trying to remove the plastic cap that eventually it shattered. 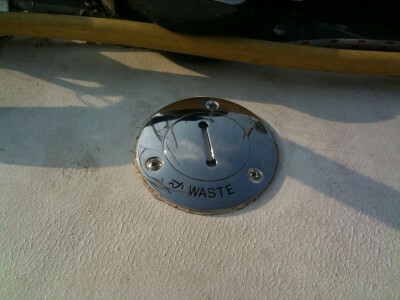 The waste deck fill cap being removed. The picture shows the old metal deck fill, but you can’t see the plastic cap thats welded in place (and now shattered to pieces). I ran out to the local chandlery and bought a new all metal deck fill. Be sure to double check the outer diameter as I wasted some time buying the wrong size at West Marine. 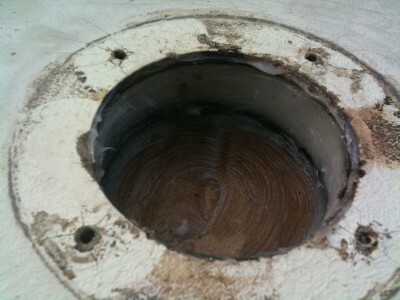 Waste deck fill removed, and the soggy wood between the fiberglass is scraped out. Once you have removed the deck fill, you need to clean up the new surface area. The wood between the fiberglass layers had soaked up water from over the years. It was a good thing I got to this project as now I have a chance to bed the cap properly and prevent getting a soggy deck. I scraped all the soggy wood surrounding the hole with a screwdriver the best I could until I hit dry wood. The gap filled up with thickened epoxy. The bottom gap has carboard taped over while I worked. Make sure the area is dry before you being filling the gap with epoxy because if it is still damp, the epoxy will not set properly. One all the rotten and soggy wood is removed, I mixed up some West System Epoxy and colloidal silican filler to thicken it up. I also wet out the inside surface with runny epoxy to let it seep into all the nooks and crannies. I then carefully stuffed the gap up with the thickened epoxy. To keep any of the epoxy from accidentally falling into the boat, I plugged the bottom gap up with some cardboard and masking tape. Once the epoxy had cured, I started cleaning up the top skin of the fiberglass. Be sure to clean this really well. Any traces of the old sealant will hamper the new sealant from making a nice bond. Silicone is especially hard to remove as it really leaves a stubborn film on the fiberglass that refuses to leave even after sanding away with sandpaper. I try to wipe the surface down with acetone or rubbing alcohol to clean it up the best I can. 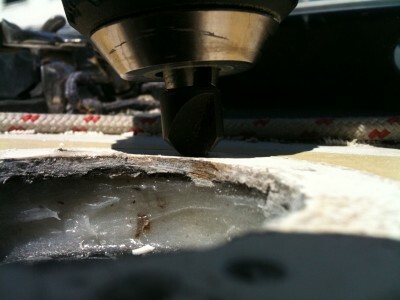 Drilling new screw holes for the waste deck fill. 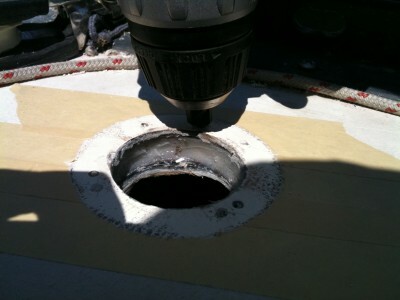 In this photo I am drilling new holes for the deck fill. The new deck fill had a different hole pattern so I made sure to fill in the old screw holes with epoxy. The masking tape is on the deck in preparation for when I bed the sealant. That way any excess sealant gooping up can be wiped away easily and once I peel the masking tape away it will reveal a nice clean deck. Using a chamfer bit to added beveled edges to all the screw holes. When drilling the holes, be sure to bevel the screw holes. This creates a gap for the sealant to collect and create a gasket under the screw bolt head. You can pick up a chamfer bits from Home Depot. It will also prevent your deck fiberglass from cracking, so its worth to take the extra expense and get a set of these bits for future projects. The final result, deck fill in place. This final photo was taken a few months later. The deck is a bit dirty as it is close to where we climb on and off the boat. The sealant is holding up well and water tight. 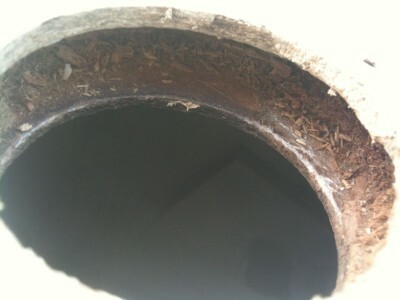 Even if it did get in, the core around the hole is solid fiberglass and will not get water damaged. I am quite pleased with the new look of the deck fill and it matches the new fuel deck fill I had installed during my cockpit rebuild project.